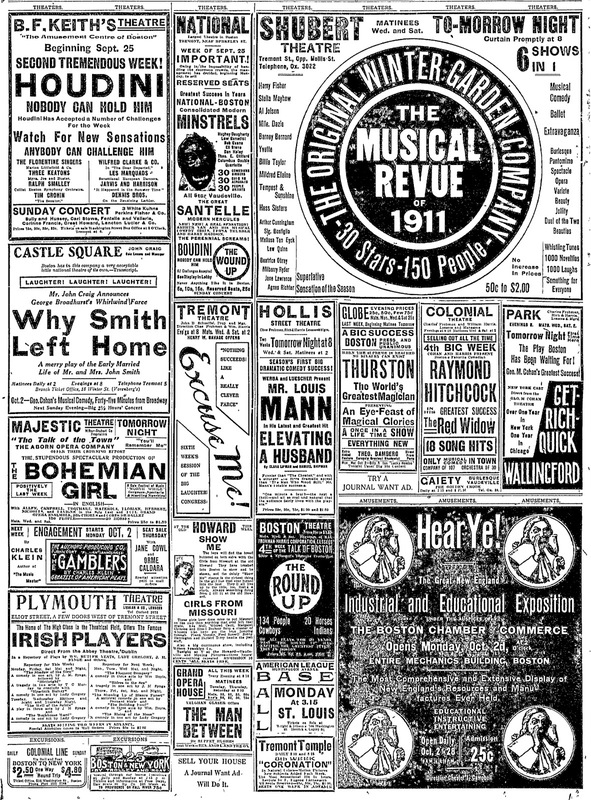 Above is a theatrical page from 1907 edition of the Boston Journal. There are a number of interesting things to point out on this page full of ads. First, you'll notice that the Houdini ad is at the top of the page on the left. It's the first spot you'd see if you are reading left to right. His name is the largest in the ad and in fact, half the ad is devoted to his act, "HOUDINI - NOBODY CAN HOLD HIM" slightly below that it reads "ANYBODY CAN CHALLENGE HIM". Look at the ad to the immediate right, for the National Theatre, and then go to the bottom of the ad and you'll see 'BOUDINI-NOBODY CAN HOLD HIM', followed by 'ALL CHALLENGES ACCEPTED'. Houdini's imitators were right on his heels, even in the paper, but they never got the notoriety that he did! Over at the WildAboutHarry blog, you can find an article describing a challenge that took place between Houdini and Boudini in 1905. 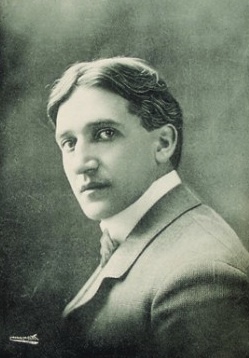 The outcome didn't seem to stop Boudini from performing because here he is two years later performing in the same town at the same time as Houdini. 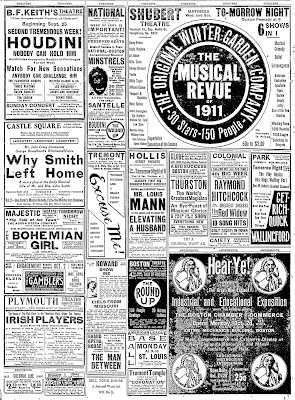 If you go back to the first add for B.F. Keith's and look below the Houdini stuff, you'll see one of the acts on the bill THREE KEATONS Myra, Joe and Buster. 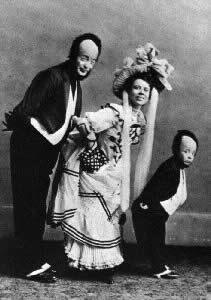 This is young Buster Keaton's family. His real name was Joseph Frank Keaton. The story is that one day the young boy fell down some stairs and though he was ok, Houdini proclaimed 'he's a real buster' or 'that was a real buster'. The name 'buster' stuck, and his family referred to the boy as Buster the rest of his life. Even Buster Keaton himself told this very story on how he got his name. By the way, Houdini and Bess were also Busters Godparents. One other interesting fact about Houdini and the Keatons. According to a number of sources, Houdini and Joe Keaton (father) owned The Mohwak Indian Medicine Company, a traveling medicine show in 1895. This seems to be well documented in the Buster Keaton biographies, but I've never seen it mentioned in the Houdini biographies, though they do mention the story of Houdini giving the boy the nickname. Their traveling medicine show must not have lasted very long. In the Life and Many Deaths of Harry Houdini by Ruth Brandon, she mentions that in 1897, the Keatons and Houdinis worked together in Dr. Hill's California Concert Company, which was also a traveling medicine show. In HOUDINI!!! by Kenneth Silverman, he mentions that it was the California Concert Company where Houdini began to present a Spiritualistic Seance Act. 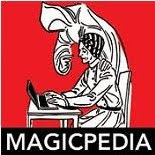 The act ended in 1898 when the company disbanded, and not a second too soon for Houdini who did not like deceiving people with seances. Finally, near the center of the page there is an ad for the GLOBE. In the ad is THURSTON-The World's Greatest Magician. Theo Bamberg is also listed as being in the show and doing his Shadowgraphy act (hand shadows). This ad appears in the same year that Thurston met with Harry Kellar about becoming his successor and buying his show. No mention of Kellar in the ad, so this might have been just prior to that agreement. Kellar and Thurston toured together in the 1907-1908 season. A lot of magic history on one newspaper theatre page! These newspaper things you've been finding are really interesting. Glad you are enjoying them. I'm a bit astonished at all the tidbits of information that I'm gleaning via the newspapers of old. Wow, what a Boudini ad! That lends evidence that he was a real performer and not a plant in the Houdini-Boudini challenge. Another great find. I think I remember reading in the Kalush book that the whole Houdini giving Buster his nickname thing was true, but didn't involve Houdini, rather, it was some not famous vaudeville magician. It worked better as publicity, for all parties involved, to credit the nickname to Houdini. I think that Kalush points out that Houdini and the Keatons didn't work the same venues until after the nickname was established. Thoughts? The connections to Houdini and Keaton that I did were mostly via Buster Keaton biographies. There are various mentions in the different Houdini bios, but I wanted to check the Keaton side to see if it matched up. I'd have to go back and look at the Kalush research and see. 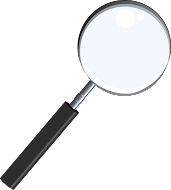 Bill is an excellent historian and researcher so perhaps he found something that I did not find.